Tattoo Blog » Sean Herman: Sweet Home Alabama. 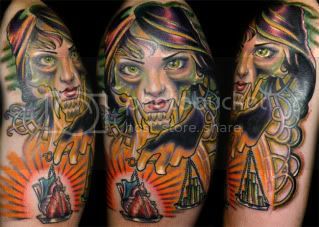 Tattoo Blog » Pictures » Sean Herman: Sweet Home Alabama. Sean Herman: Sweet Home Alabama. Yeah. I know. I copped the title from the greatest southern rock band of all time, Lynyrd Skynyrd. Well as an old southern boy who calls himself Dr. Hook, what did you expect? Far more than just great music comes out of the south. 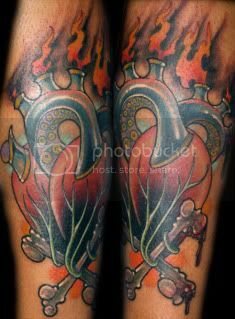 Great and innovative tattoo artists make their home there as well. So, without further ado from me, let me introduce you to my newest friend, Sean Herman of Royal Street Tattoo in Mobile, Alabama. I’m glad they did. As you can see from the few examples of Sean’s work seen here both Kele, and Justin have every reason to be proud of having Sean as an adept pupil. Sean’s sense of style, and solid, eye-popping work convinces me all the more that there really is no excuse for anyone to have a bad tattoo. You can see even more of Sean’s ability here at his Online gallery. Other than cheap bad judgment that is. Lets face it, Gang. With talented artists like Sean out there working, if you got a bad tattoo, that’s on you. Sean sites the work of the great masters, such as Bernini, as some of the biggest influences, as well as being a fan of comic book art and horror films while growing up. Strangely enough Sean went to college for a lot of different things other than art, one of them being the Theater. While studying for that class, one of the things that was required was costume design. It was there that he began to do sketches for costumes. 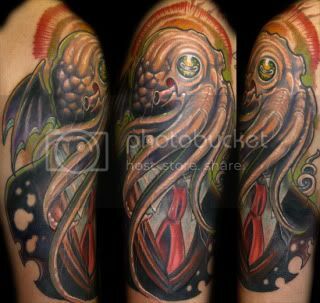 The art bug obviously caught, but he credit’s the tattoo artist friends around him for his skill. And, brother, we are talking some serious skills here. Sean’s amazing talent has been featured in such great tattoo magazines as Skin and Ink, International Tattoo Magazine, Tattoo Revue, Skin Deep, Tattoo, Savage, Pain, Urban Ink, and on and on! Sean has also won numerous awards at many conventions in his short six years as a professional, But he keeps a philosophical outlook on such things. I’ll give that an Amen! I’ve said so myself quite often in my articles here, and I’ve noticed that every artist who grants me an interview says the same thing. For artists like Sean it’s not about the pats on the back, (although those are nice, and I will say they deserve them), it’s about the collectors. With any good tattoo artist the client comes first. Thank you for backing me up on that one, Sean. One of the questions I ask a tattoo artist in my interview is, “What would you like the Tattoo Community to know most about you?” Now, I know this is a tough question to answer. That’s why I use it. You can get a real feel for the artist by their answer. Like I said before, a true southern gentleman. As his biggest influences in the noble art of tattooing Sean gives credit to the time he spent tattooing with Josh Woods, who taught him the art of color blending and how to use bright tones. He also gives a well deserved nod to his partners in crime at Royal Street, CW, Pony and Pete. Either a trip to Mobile, or being lucky enough to catch Sean at a convention will be well worth the effort. All images ©Sean Herman. All rights reserved.